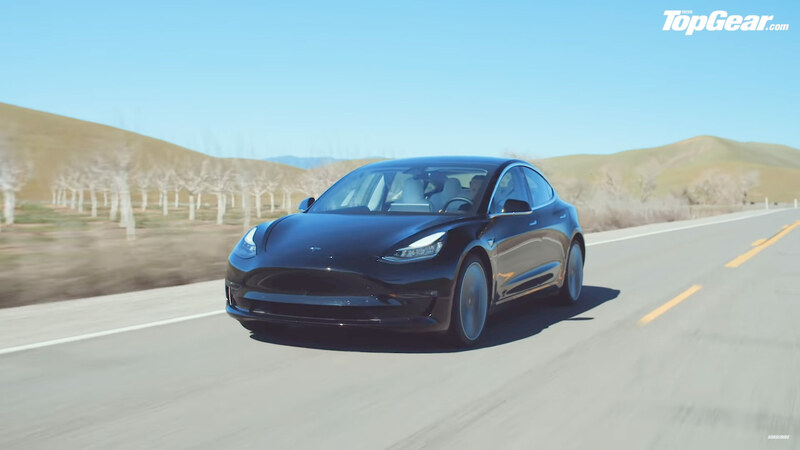 Top Gear’s latest video featuring Tesla packs a punch of content from the tour of the gigantic Fremont Factory, a Tesla Model 3 Performance long trip from San Francisco to Tesla Design Studio in Hawthorne, California, and finally arriving at the Tesla Model Y unveil event evening. Of course, a lot happens in this 18 min 49 secs of Tesla kool-aid where Top Gear’s Jack Rix seems to be really impressed, even though he’s not an Elon/Tesla fanboy but living 24 hours under the influence has its effects. 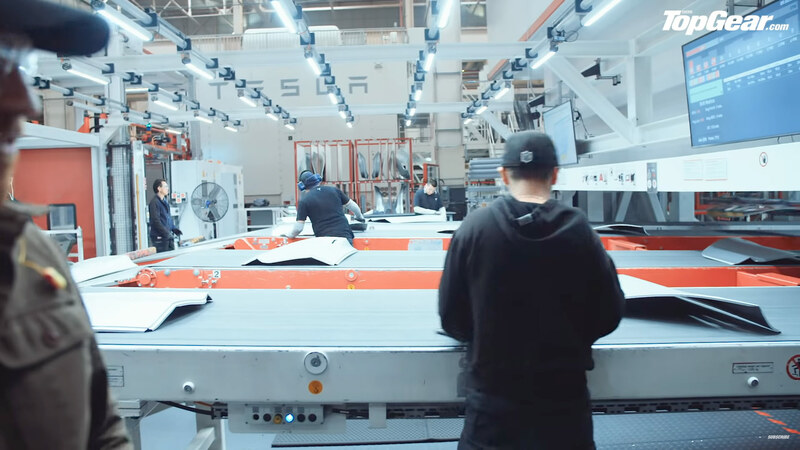 Watching the massive robots working on the Tesla Model S, 3 and X production lines once again awaken the memory of an Alien Dreadnought that Elon Musk has talked about in the past — he even tried the v1.5 of it with the Model 3 production but it did not work out the way he imagined it. 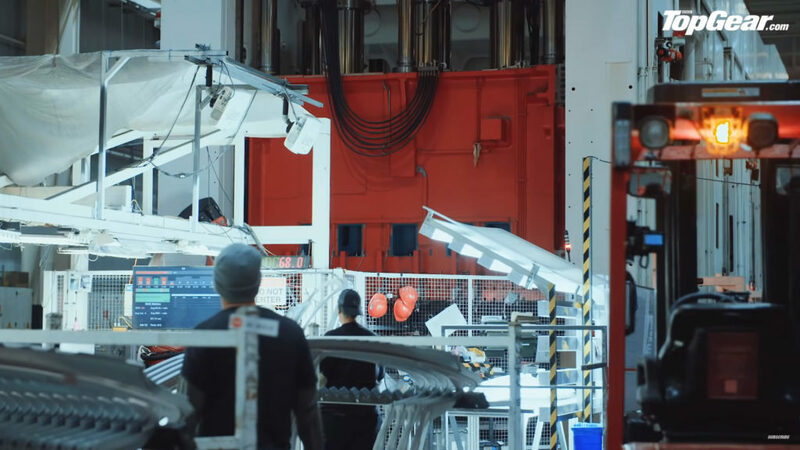 So we can also see humans actually working in various parts of the Fremont Factory, proving the supremacy of the human hands over current robot technology, admitted by the Tesla CEO after coming out of the Model 3 production reckoning. The above shots from the video show the human workers checking and sanding off the edges of the door panels and the massive hydraulic machine that exerts 500 tons (500k KG) of pressure on the steel panels, this is actually the biggest hydraulic press in any North American factory — rare sightings for sure. 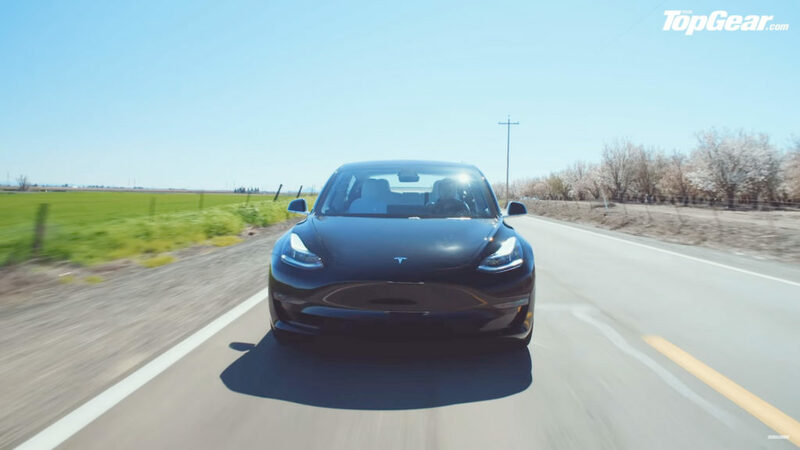 After leaving the factory, Jack takes a Tesla Model 3 Performance for a highway journey of 360 miles (~580 km) from San Francisco to Los Angeles, Top Gear did a fantastic job of filming the car while it was on the roll. Jack stops at the Kettleman City Supercharger which is notorious for the Tesla Semi sightings and enjoys a chilling experience in Tesla drivers exclusive lounge at the Supercharging location. Kettleman City Supercharger is one of the largest Tesla/EV charging stations in the world with around 40-50 stalls. Although the charge port of a Tesla Model 3 or any Tesla vehicle can be opened by pressing the button on the charging connector or gently pressing the charge port flap, Jack opened it by touching the center touchscreen control (Top Gear must have learned the right way to do it after YouTube comments). The video is shot on the Model Y unveil event day which was on 14th March and since then the Tesla Model 3 has unlocked V3 Supercharging capability and even on a V2 Supercharger the vehicle would charge faster today than the video is displaying on the Model 3 screen. Finally, Jack Rix reaches the Tesla Model Y unveil evening, where he meets several Tesla enthusiasts, passionate owners, social influencers and die-hard Elon Musk fans, this is another world, unimaginable to the traditional automakers, it’s not just about cars, it’s about the Tesla’s secret mission. Top Gear crew was not allowed to take their camera equipment to the Model Y event and Jack had to shoot everything with his iPhone, but still he managed to give us some good glimpses of the white Model Y that probably was a non-working prototype, just there for display purposes. Let’s jump in to watch the video which is pure 18:49 mins of entertainment — let us know your thoughts in the comments section below.